Brooklyn was hit hard this week by a spring storm that left 200,000 east coasters without power and caused a massive amount of property damage to homes and businesses throughout New York. The storm system seemed to appear out of nowhere when a sunny spring day suddenly brought doom and gloom to the borough. Heavy rainfall and powerful winds were the main destructive components to this storm that swooped in wrecked havoc on Brooklynites. Home and business owners dealt with flooding and water damage due to the heavy rainfall, as well as property damage caused by the tornado-level winds that ripped through the city, blowing debris into buildings, knocking over trees and downing power lines. The loss of power caused by these powerful winds is estimated to last for days, with no exact restoration time offered at this point. Repair workers have been scrambling to remove fallen trees and large branches in order to repair the damaged power lines, which has proven to be an arduous task. Between the wind and rain damage brought on by this spring storm, the Brooklyn community has a lot to bounce back from, but this is nothing they haven’t experienced before. Unfortunately, there will probably be more severe weather to come this spring, so the best thing you can do is start preparing your property now. When a city like Brooklyn experiences a massive amount of rainfall in a short period of time, the residents are going to be left in a wake of destruction. Many of buildings in Brooklyn are old, meaning that the infrastructure of these apartments and other buildings are going to feel the impact of a storm more severely than new buildings that have been built to withstand the harsh elements. This particular storm caused a lot of rain throughout New York and Brooklyn, which left property owners dealing with flooded basements. 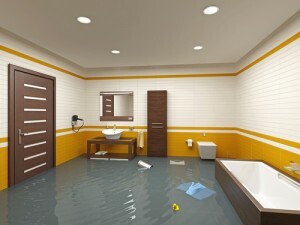 A basement flood is never fun, but there are some pretty simple steps you can take to keep your space from becoming completely overrun by water damage. The most important thing to have in your basement is a sump pump. This is a device that begins pumping water out of the area as soon as it senses that a flood is underway. This can buy you valuable time and stop significant water damage from occurring while you call professional remediation assistance. Most people use their basements as storage spaces, so when they flood your personal items can become damaged and even destroyed. The best way to anticipate a flood and keep your items dry is to never put anything directly on the ground. By putting all of your items on shelving units, table tops or even cinder blocks, you can be keep your items protected. Most of the older buildings and brownstones in Brooklyn are very old and have old plumbing systems installed that has not been overhauled as they probably should have been over the years. During a storm, many of the plumbing systems cannot handle the increased amount of water that floods the area. When there is too much water going into the city’s drains, the plumbing can not process it properly. The water is forced to go into pipes that are already filled to capacity, created more pressure then the pipes can handle. This then causes pipes burst, which will then cause a flood in your property. If there is a storm raging outside, and you begin noticing that the pipes in your bathroom or kitchen begin leaking, then it could be a sign that they are struggling to process the rainwater that is passing through. To prevent a pipe burst in your property, you may want to call professionals to come check out your plumbing system to make sure that it is not on the brink of rupturing.